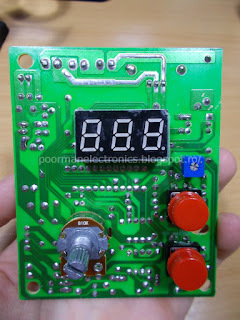 Simple electronic projects which can be built by beginners that are on a tight budget. 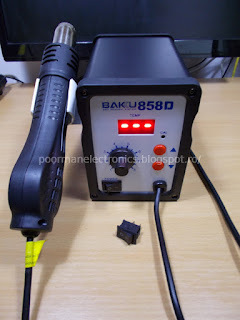 If you're familiar with SMD soldering, you probably know about the 858 series of chinese-made, el-cheapo SMD rework stations. There are probably tens of small companies manufacturing these stations (Atten, Baku, Scotle, YOUYUE, KADA, W.E.P, Saike, YIHUA, BEST, Quick, etc.). Of course, on the exterior they almost all look the same. The internals are quite different though, some of them use the Mikkon MK1841D3 microcontroller (which according to a thread over at eevblog is a clone of Samsung S3F9454), a Holtek HT46R23 or an AVR MCU. The AVR-based ones are much better value since they're reprogramable, but there's no way to tell which station uses which MCU based on their looks. 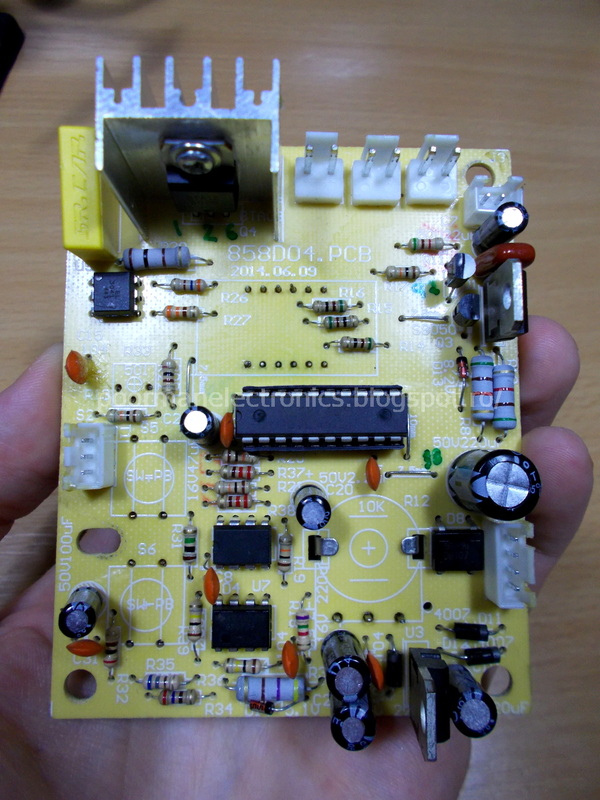 One model known to use an Atmega8 MCU is the Youyue 858D+. Unfortunately mine ( BAKU 858D ) uses the MK1841D3 which is an OTP (one-time programmable) MCU so there is no way to tinker with it or write my own firmware. On the more positive side, it works quite well as-is, except for some minor quirks, like the temperature overshoot when turning it on and the overall quality of the components. Recently the power button from my unit has broken off so I opened it up to replace it and also made some pictures of the interior. Hopefully these will help someone make a general idea of this model's quality and also help compare it with other "brands". PCB reverse. Please note the crapacitors. One nice thing about these units is that they use a centrifugal fan instead of the membrane air pump like the older stations from Gordak. There is much less noise and vibration, not to mention they're more reliable. There's no heat generated inside and they can provide good airflow, up to 120 l/min (compared to 24 l/min for diaphragm pumps). Both the heater and the fan are located in the hot air wand, an improvement over the older stations. This way the unit case is smaller since it only hosts the control circuitry and the transformer. I had a little bit of free time so, as an exercise of patience I have reverse engineered the PCB and made a schematic for this unit. 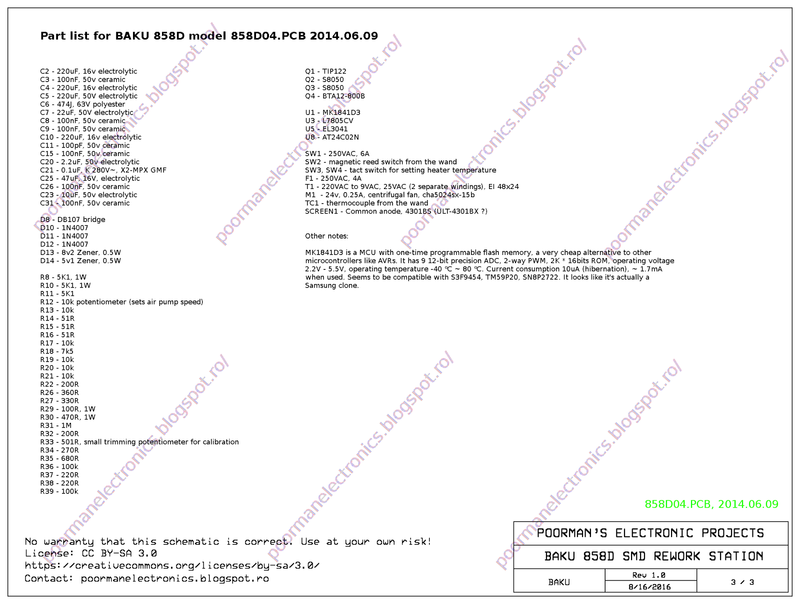 At the time of writing this, this is the only complete schematic for this model (Baku 858D, 858D04.PCB from 2014.06.09). The main reason for drawing it is for future troubleshooting. 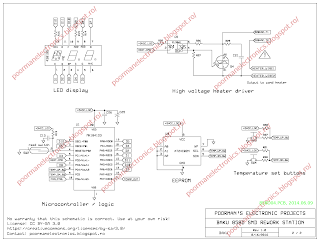 An interesting idea would be to modify the schematic to work with an AVR instead of the Mikkon MCU. 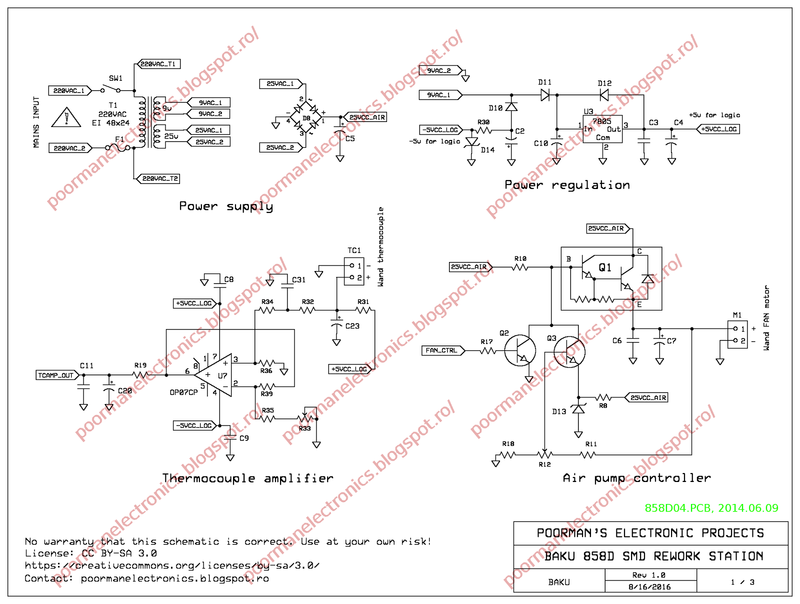 The rest of the circuit seems to be well designed, no modifications are required. 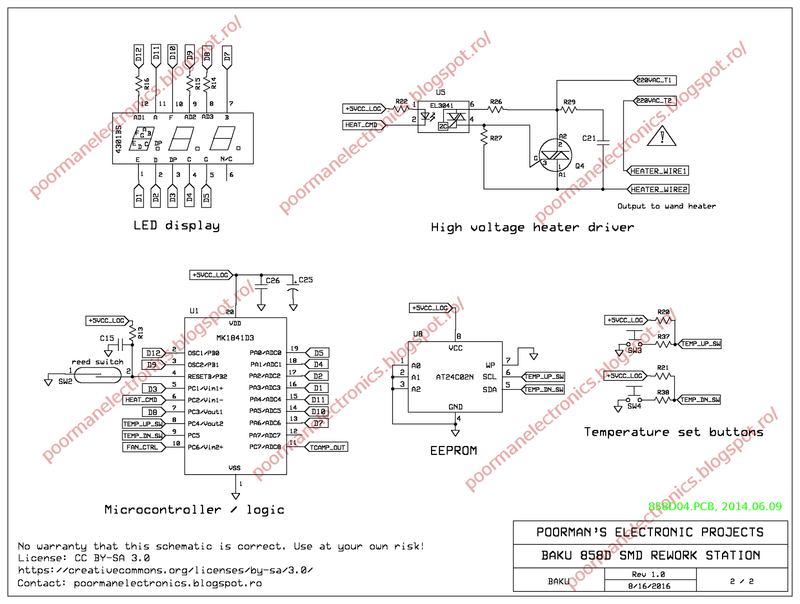 Note that the schematic drawing might have mistakes. It comes without any warranty of any kind, use it at your own risk. All in all, this type of rework station is quite decent, I recommend it over the old Gordak stations which were noisy and bulky. What I don't recommend is getting this exact model. If you want to buy an 858D, find one which is better built by looking at the comments on the seller's site. 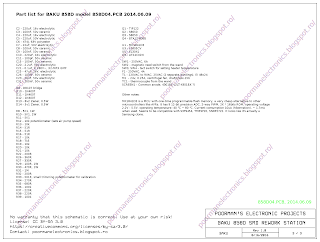 Maybe a Youyue 858D+ would be the best choice (since it uses an Atmega8 MCU). Apparently not all of the Youyue 858D units are the same. I just bought one, but it has the exact same board as your 858D. With the help of your schematics, I will make an adapter board so I can run some custom firmware on it. Do you know the maximum voltage the magnetic reed switch can take? Hi. I have no idea because it has no markings on it. It also looks kind of fragile. In the soldering station it works with logic level voltage (5 volts), so I wouldn't trust it with more power than that. Recently I bought one unit identical, but when I turned it on for first time, the hot air station started it to work, and then I setting the temp at 200 degrees, then, when I remove the hot air gun from the station, the fan started work but never had flow hot air, and the display goes up imediatly at 892 number (I think are degrees) and after several seconds the display goes at H-E. I guess is an error of the signal from the temp sense or microcontroller or whatever. Do you have some idea from this failure and if is possible to repair it? 2. 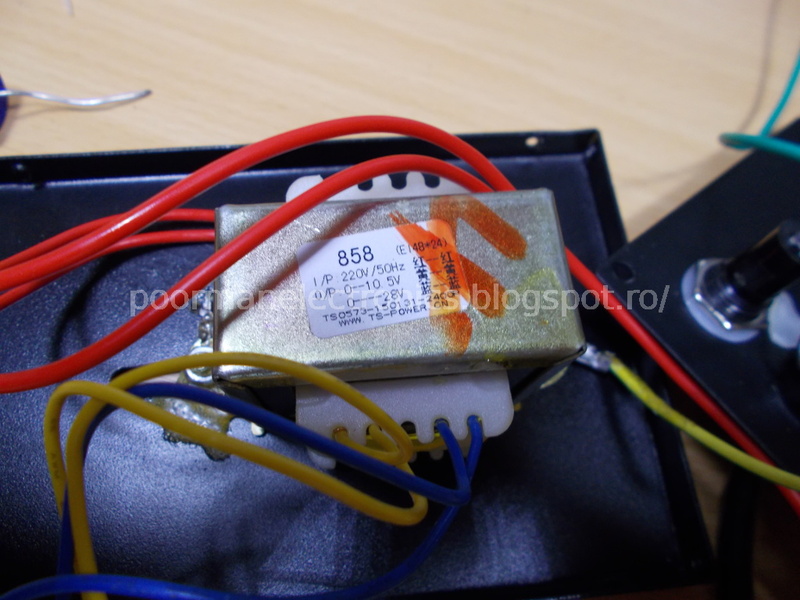 Check if the wires from the thermocouple are not broken. 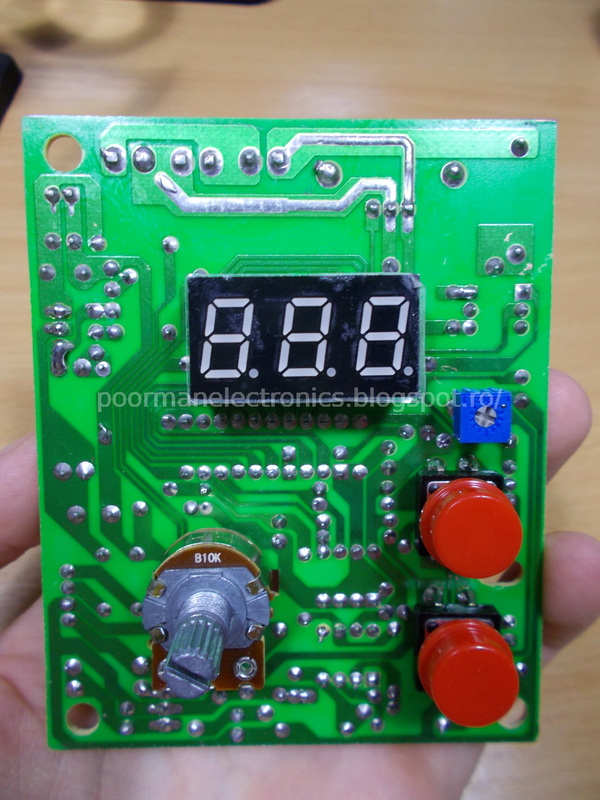 Use continuity check of multimeter and check them from wand to the pcb of the station. I think this is what makes the error. The MCU can't read the temperature because the sensor wire is interrupted. I had the same problem... first, "892", then "H-E"
It turned out to be a bad ground connection between the two pushbuttons. I soldered a wire between the outer ground pins of the pushbuttons, and it's now working perfectly. The reason you get the "892" is because the negative lead of the thermocouple lead is grounded via the pushbuttons. 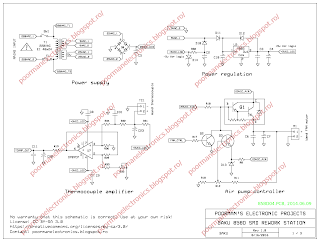 If there is a break in the ground, the thermocouple is pulled to a higher voltage ( via R31) and the opamp goes into saturation trying to amplify it. The saturation voltage is about 4V, which the MCU interprets as ~892 deg. Then, after a couple of seconds it goes into error mode. Anyway, check that the black thermocouple wire is properly grounded. In my case, the problem was intermittent, and showed up when the board flexed (due to pushing buttons). Thank you for sharing your experience. Bad solder joints seem to happen much more often since the ROHS directives were implemented and lead was taken out of the solder. BTW: Thanks for putting all this info online! Without it I would have never been able to fix my 858! Thanks for the kind words, glad it helped :). ciao la mia ha un problema:non parte la ventola e nel display mi scrive s-e.cosa puo' essere? I had the same problem... first, "100", then "C-H I"
some segments of the display do not work in the first few minutes after switching on. then after a while the unit is switched on, the display segments begin to appear. what can it be? I have already changed the resistances to 51 ohms (R14-15-16). it seemed to work, but then it started again to give problems. Copyright (c) T. Alexandru. All rights reserved. Awesome Inc. theme. Powered by Blogger.